This article explains how to identify and fix problems with deleting iCloud backups. You may create iCloud backups of your iPhone, iPad, or iPod touch so you don’t lose your important information on your iOS device. 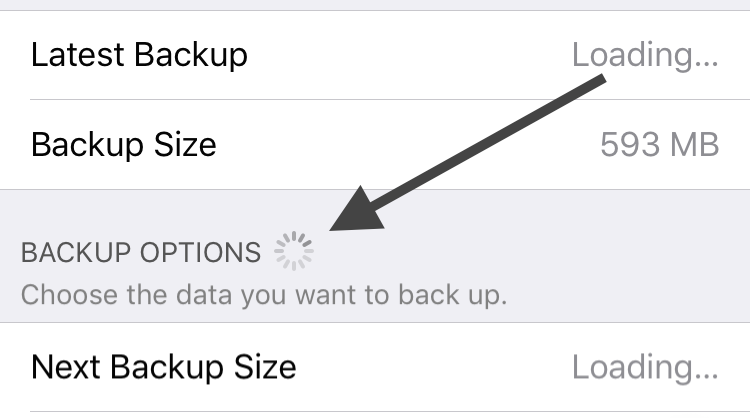 While backups are important, you may want to remove old backups to free up space in iCloud. For instance you may want to delete your iCloud backups for devices you no longer own. Cannot Delete Backup. This backup cannot be deleted at this time. How to fix “Cannot Delete Backup” iCloud Error. 1-Reboot your device by pressing and holding the Sleep/Wake button until you see the red slider. Simply swipe the slide to power off. To turn your device back on, press and hold the Sleep/Wake button until you see the Apple logo. Wait a few seconds until this wait cursor is gone. 3-Log out of iCloud by going to Settings > iCloud and Sign Out. Wait a few seconds and go to Settings > iCloud on your iOS device (iPhone or iPad), and sign in. 4-Tap Settings > iCloud > Backup > and turn off ‘iCloud Backup’, wait a few seconds and turn on again. 5-Try removing your backup using another device. For instance, you may use your Mac by going to Apple menu > System Preferences, click iCloud, click Manage then Delete. 6-Reset your iOS device by pressing and holding down the Sleep/Wake and Home buttons together until you see the Apple logo. 7-Make sure your iOS device is running the latest version of iOS. You can check by going to Settings > General > Software Update. Tried every step in this article, twice now, in the order set out. No success. P.S. — I finally was able to delete the backup. I had to first go into Settings > iCloud > Storage > Manage Storage; selected the backup I wanted to delete. It listed all the component items backed up. I disabled Photo Library, which was the largest component. Got the question “Do you want to turn off Photo Library’s backups and delete the backup data from iCloud?” I selected Turn Off & Delete, the data deleted successfully. I was then able to delete the parent backup. iPhone 6 Plus running OS 9.3.1. This fix worked for me, too, though the backup could not be deleted until I had turned Photo Library off and on again. Thank you so much I hadn’t had a backup since January and now I can finally take my phone out safely. Like you, Patricia, tried and failed twice, read your tip, tried and failed again. Just a small backup, not even 4 GB, and resolved to carry it throughout my life, but then, days later, pressed delete and voila, it was gone. O joy! Perhaps Apple is sincere when they say “backup cannot be deleted at this time.” Lesson learned: when all else fails, leave it alone for a few days. I have tried many time to delete my old back up without success until your tip. I did have to wait one day after cycling pic sharing on/off for it to work. I can’t believe Apple makes it this hard to do. Thanks. step 2 worked for me! thanks a billion. I have repeatedly tried all of the steps mentioned in the article and it just doesn’t work for me. I have had this issue since late last year and have contacted Apple but they can’t figure out what to do. They see an update that did not complete…but I can’t see an update to delete (when I attempt from a different device or from my MacBook). Sometimes the option to delete a backup doesn’t show on my iPhone either but it still shows me having less than half a gb available for backup. Extremely frustrating. None of the above steps work for me either and the backup i need to remove does not list the details of the back up. Any ideas. Anyone… anyone…. I have tried everything and am recycling my old iPad through a reseller. I have to ship it off today, but will continue to try to delete the 1.7gb of back-up data even after it goes in the mail. I even upgraded my storage. Nothing helps. I hope that leaving it for a day or two will be the fix. if you turn off photo library it will finally back up after all these steps. I have the same issue here. Cannot delete the old backup after restoring on a new iPhone. Have you figured this out? Any help is appreciated. Thanks! Hello guys, I have a same issue, I know it’s been a long time for you but it fustrates me so much. Did you manage to do it? 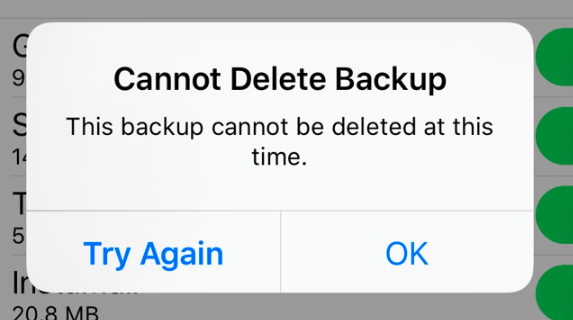 If you have recently attempted a restore from the back-up you’re trying to delete, Apple locks the back-up from deletion for a few days, in order to preserve the back-up file to compensate for possible interruptions while restoring. Wait a few days and try deleting the back-up again. I have tried all of these steps and have tried to delete the frozen backup from my iPhone, from my iMac and from my iPad and get the same message that the backup cannot be deleted at this time on each one. I don’t have the photo library enabled and nothing is saved on my devices. so FRUSTRATED. Same with my old phone. Have you managed to delete the backup until now?